AUSTIN, F. Britten: A SIREN OF THE TROPICS (Sydney Seymour Lucas). Story with two endings. 367 July (DOYLE). Fenn SHERIE: SHERLOCK HOLMES ON THE FILM: AN INTERVIEW WITH EILLE NORWOOD* (photographs). Doyle comments on the photographs. ROBINSON, W. Heath: THE HOME-MADE CAR. Five full-page drawings. 369 Sept (DOYLE). Advertisement for "The Adventure of the Mazarin Stone"
ROBINSON, W. Heath: HOW I WOULD SOLVE THE TRAFFIC PROBLEM. Four drawings. 373 Jan (DOYLE). Advertisement for "The Problem of Thor Bridge" and "The Lift"
379 Jul DOYLE: "NOW THEN, SMITH!" (E.G. Oakdale). A poem. ROBINSON, W.Heath: AQUATIC GOLF. Four full-page drawings. CRAWSHAY-WILLIAMS, Eliot: "E. & 0. E." (photographs). Author's short story version of his play, specially written for The Strand Magazine. 381 Sept (DOYLE). SHERLOCK HOLMES IN REAL LIFE* (Howard K. Elcock). By a Barrister and Ex-Official of New Scotland Yard. 387 Mar DOYLE: THE ADVENTURE OF THE CREEPING MAN (Howard Elcock). Sherlock Holmes portrait on cover. 393 Sept (DOYLE). CONAN DOYLE'S REMINISCENCES. * Half-page announcement. 394 Oct DOYLE: MEMORIES AND ADVENTURES: I* (drawings and photographs). Issues 394-403. 395 Nov DOYLE: MEMORIES AND ADVENTURES: II* (drawings and photographs). Issues 394-403. 396 Dec DOYLE: MEMORIES AND ADVENTURES: III* (drawings and photographs). Issues 394-403. CHURCHILL, Rt.Hon. Winston: MY ESCAPE FROM THE BOERS: I* (drawings and photographs). Issues 396-397. 397 Jan DOYLE: MEMORIES AND ADVENTURES: IV* (drawings and photographs).Issues 394-403. 398 Feb DOYLE: MEMORIES AND ADVENTURES: V* (drawings and photographs).Issues 394-403. 399 Mar DOYLE: MEMORIES AND ADVENTURES: VI* (H.K. Elcock). Issues 394-403. 400 Apr DOYLE: MEMORIES AND ADVENTURES: VII* (drawings and photographs), Issues 394-403. 401 May DOYLE: MEMORIES AND ADVENTURES: VIII* (drawings and photographs). Issues 394-403. 402 Jun DOYLE: MEMORIES AND ADVENTURES: IX* (drawings and photographs).Issues 394-403. 409 Jan DOYLE: THE ADVENTURE OF THE THREE GARRIDEBS (Howard Elcock) Cover inset. 414 Jun (DOYLE). IMPORTANT NOTICE. * Announcement of "The Land of the Mist". 415 Jul DOYLE: THE LAND OF THE MIST or, THE QUEST OF EDWARD MALONE: I (F.E.Hiley) Cover illustration. Issues 415-423. 416 Aug DOYLE: THE LAND OF THE MIST: II (F.E. Hiley). Issues 415-423. 417 Sept DOYLE: THE LAND OF THE MIST: III (F. E.Hiley). Issues 415-423. 418 Oct DOYLE: THE LAND OF THE MIST: IV (F.E. Hiley). Issues 415-423. 419 Nov DOYLE: THE LAND OF THE MIST: V (F.E. Hiley). Issues 415-423. 420 Dec DOYLE: THE LAND OF THE MIST: VI (F.E. Hiley). Issues 415-423. 421 Jan DOYLE: THE LAND OF THE MIST: VII (F.E. Hiley). Issues 415-423. KIPLING, Rudyard: THE PROPAGATION OF KNOWLEDGE (C.E. Brock). Cover inset. 422 Feb DOYLE: THE LAND OF THE MIST: VIII (F.E. Hiley). Issues 415-423. 423 Mar DOYLE: THE LAND OF THE MIST: IX (F.E. Hiley). Issues 415-423. BELL, J.J.: THE PURSE (Stanley Lloyd). Cover illustration. SAPPER: CYNTHIA DELMORTON'S MISTAKE (Norman Sutcliffe). Cover illustration. 430 Oct DOYLE: THE ADVENTURE OF THE THREE GABLES (Howard Elcock). Cover illustration. 431 Nov DOYLE: THE ADVENTURE OF THE BLANCHED SOLDIER (Howard Elcock). 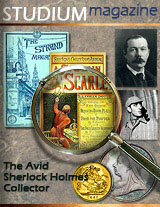 Sherlock Holmes inset on cover.